— Laura Ingraham on Thursday, June 12th, 2014 in a broadcast of the "Laura Ingraham Show"
By Jon Greenberg on Friday, June 13th, 2014 at 11:42 a.m. The Benz Patent-Motorwagen, built in 1886. Many consider it the first automobile -- and it came from Germany, not the United States. Americans have a reputation for ingenuity -- but it can be tempting to give more credit than is deserved. In a recent radio show, conservative talk-radio host Laura Ingraham responded to a caller who noted that in some jobs, immigrants outperform Americans. Ingraham sought to reframe the issue. "Americans won the war with our allies in World War II," Ingraham said. "Americans developed some of the most groundbreaking pieces of technology that the world has ever seen. We invented the automobile. We invented the airplane. Americans can do those jobs." There’s no doubt that the Wright brothers invented the airplane, and Henry Ford was a major player in making the car a global commercial success. But a listener to Ingraham's show was pretty sure that she was off the mark when she said Americans invented the automobile. The listener asked us to look into it, so we did. When we contacted University of Dayton automobile historian John Heitmann, he said the car’s roots are in Europe. "The automobile is European by birth, American by adoption," Heitmann said. "German inventors and French entrepreneurs led the way." 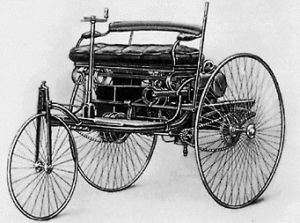 The first patent for an internal combustion powered car -- a two-seater -- was filed on Jan. 29, 1886 by Karl Benz in Germany. Benz’s names lives on in the Mercedes-Benz brand. We also checked with John Lienhard, a professor of technology at the University of Houston. In a radio series on innovation, Lienhard said a few people actually built powered vehicles before Benz. For instance, Austrian engineer Sigfried Marcus invented the carburator for his first gas-powered car in 1864. Marcus built a second prototype sometime between 1875 and 1888. The car is owned today by the Austrian Automobile, Motorcycle and Touring Club in Vienna. Reportedly, it still runs. Steam-powered cars date back even earlier -- to 1769 in France. Lienhard told PunditFact he shudders at having to figure out the question of who was "first," since the path to what we know today as the car included many zig-zags, incremental improvements and dead ends. He wrote a book, How Invention Begins, about the many efforts that ultimately produced the car we know today. Still, he offered a rule of thumb: Look at who had the first commercial success. By that standard, the nod goes to Benz. "He built a little three-wheeled car in 1885 and sold his first one two years later," Lienhard wrote. "He went into production with a four-wheeled model in 1890." We should note that America was not too far behind Benz. According to the University of Michigan’s Bentley Historical Library, William Morrison constructed an electric carriage that he drove through Des Moines, Iowa, in 1891. In 1893, Frank Duryea exhibited a motorized truck, using an internal combustion engine. The first sales to the American public took place in 1896. "Once we got into the game, we moved very fast," Lienhard said. "Our role in the development of the automobile was huge." Ingraham show producer Julia Hahn told us Ingraham was thinking of Americans’ early work in engine design. Ingraham said that Americans invented the automobile. If we look at internal combustion-powered vehicles, all of the first examples come from Europe, and the first commercial enterprise emerged in Germany. America played a major role in automobile production, but Ingraham spoke specifically about an earlier stage -- invention. We rate the claim False. Published: Friday, June 13th, 2014 at 11:42 a.m.
John Lienhard, Engines of Our Ingenuity, The first automobile?